collectSPACE - news - "Mission Control director's sale takes flight"
December 12, 2005 -- Are you searching for the perfect holiday gift this season for the space enthusiast in your life? Is failure not an option? Veteran NASA Flight Director Gene Kranz and online space memorabilia dealer FarthestReaches.com (FRC) may just have the answer. 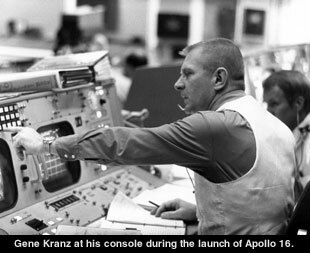 Kranz, who is best known to the public by Ed Harris's portrayal in the 1995 blockbuster Apollo 13, has partnered with FRC to sell items that he collected over his 34 years with NASA, many of those leading Mission Control. The selection from which collectors may soon be able to choose currently fills two offices at Kranz's home. Describes Kranz, "The downstairs office contains the photographs I treasure, my jet helmet, pictures of my aircraft from Korea, my leaders and team members plus framed awards. The bookcase contains about 20 mugs, my collection of military and aviation books, airplane models that I have flown, various medals, etc. One of the most treasured is a postcard with the 'Blue Max', sent to me after Apollo XI by Bernie Lay the author of Twelve O'clock High. On my desk is a bronze statue of [Apollo 13 astronaut] Jack Swigert, a History of Aviation Trophy and a 4-foot Saturn V Model." "The upstairs office contains mostly aviation pictures, awards, models and gifts from various military groups including the Golden Knights Parachute Team, a piece of the wall of the Pentagon from 9/11, a Gunners Mug from Iraq, sand from Koh Tang Island - the last battle of the Vietnam War, and heat shield plugs from Apollo IX and XI mounted in epoxy," continued Kranz. Other items in the Kranz collection include four filing cabinets of mission documentation and his journals and schedules spanning his entire career. The initial offerings, which were posted for sale on FRC's website this morning, include a choice of Kranz's Mission Control access badges, mugs, ashtrays, certificates and medallions. Prices range from less than $100 up to a few thousand dollars for rare or flown artifacts. "Gene's Mission Control badges and a presentation that includes a completely intact flown STS-1 Thermal Tile are standouts," commented Steve Hankow, FRC's founder and sole proprietor. "There are a number of great items - some rare or one of a kind - in all price ranges, making this a sale for any collector of space history, regardless of budget." Kranz considers his trademark mission vests among his most valuable possessions. One such example, that he wore during Apollo 15, 16 and 17 will soon be offered as part of FRC's sale. 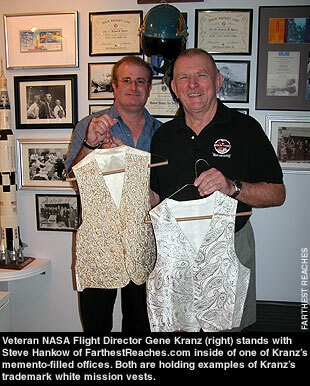 Others Kranz has donated to museums. "I donated my Apollo XIII vest permanently to the Smithsonian, and the Apollo XVII is on display in Space Center Houston." The story behind the vests may be as priceless as the garment's themselves. "It was my wife's idea," Kranz remembers. "She made scarves for many of the pilots in my squadrons and recognized the connection between pilots, squadron insignia and scarves. When the time came to form my first [Mission Control] team I was looking to identify a unique identity. My team color was white, I always wore a three piece suit with vest, so Marta suggested that she should make a white vest." "She made it, I wore it and it became a tradition." Kranz made the decision to sell now after a storm-forced evacuation led him to assess his belongings. "During the evacuation for Hurricane Rita I had to leave behind about 90% of my collection," wrote Kranz in an e- mail interview with collectSPACE.com. "Driving home from San Antonio I thought of the possible loss to space history, collectors, museums, etc." Kranz, who has been active in charity fundraising since his retirement realized he could help others in the process of finding new homes for his memorabilia. "Since retirement I started a charitable gift fund for scholarships, do fund raising for Habitat for Humanity, and various aviation museums," explained Kranz. "Most recently our local church is starting a building fund. All profits from the sale of this group of memorabilia will go to the Shrine of the True Cross Church in Dickinson, TX." Kranz may be selling his career's mementos, but it is something less tangible that he says he treasures most. "The one thing that I treasured most was the respect of my peers. Mission Control is an elite group with powerful chemistry and a genuine love for each other." That said, there is an item he wishes he still had. "I would also liked to have obtained the Flight Director Logs from our missions but we got into a battle with NASA legal that said they were government property," recounts Kranz. "They have subsequently been lost." As for the memorabilia he does have, Kranz says that he will watch how this first crop performs on the market and then decide how to proceed further. He also feels that for some items, a museum exhibit is merited. "There are several items that I believe belong back in the Mission Control Center if I could convince them to setup a museum or ready room for their display," poses Kranz. 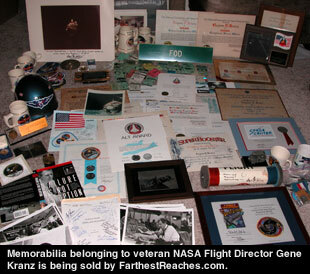 An online catalog of Kranz's memorabilia for sale can be found on FarthestReaches.com beginning 9:00 a.m. CST.